An assembly occupancy is generally defined as "an occupancy (1) used for a gathering of 50 or more persons for deliberation, worship, entertainment, eating, drinking, amusement, awaiting transportation, or similar uses; or (2) used as a special amusement building, regardless of occupant load." Assembly occupancies might include the following: Armories,assembly halls, auditoriums,club rooms, dance halls, drinking establishments and exhibition halls among others. Fires in assembly occupancies have shown to be some of the most deadly when the proper features, systems and construction materials were not present. Nightclubs, theaters and auditoriums differ from office buildings because they contain a large number of people in one main space. 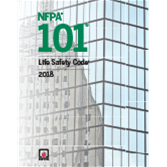 NFPA code provisions mandate that a considerable number of safety systems and features be present in order to keep everyone safe should an unwanted fire occur. The level of safety provided is not the result of any single safety system or feature, but rather is achieved through the combination of multiple safeguards that are provided. The following elements provide an outline of the most basic requirements and criteria as found in NFPA 101®, Life Safety Code®, 2000 edition. The order in which they are presented in is indicative of how they lessen a life threatening condition. Pyrotechnics – safe use of pyrotechnic displays indoors and out. Controls based on flame spread characteristics; Evaluation of existing interior finish is sometimes difficult. Where flame spread characteristics cannot be readily determined, the questionable material should be removed or treated with approved flame retardants. Where treatment cannot reduce flame spread to the required limits, automatic sprinklers can be provided to help compensate for the deficiency. The purpose of interior finish requirements is to slow the flame spread across these surfaces to allow additional time for occupants to relocate or evacuate the building. Fire testing – for purpose of evaluating flame spread and smoke development characteristics. Interior finish – exposed surfaces of walls, ceilings, and floors within buildings. Decorations and Panels – hanging or mounting of these materials, even if on a temporary basis, can introduce a source of combustible fuel. Proper treatment and use of these materials is crucial. Fire alarm systems – this includes means for detection of a fire, initiation of the alarm and/or suppression systems, and notification of occupants. Automatic sprinkler systems – sprinkler systems are required in most new occupancies and many existing occupancies. Portable fire extinguishers – extinguishers should be provided in specific types of assembly occupancies, and must be used only by properly trained personnel. Occupant load - the number of people anticipated to be in the building is a function of the intended use of that building. Based upon this calculated value, other criteria, such as the number of exits and the width of exits are derived. Number and arrangement of exits-in general terms, at least two exits need to be provided from each building. In an assembly occupancy, it is also important that the main entrance/exit be adequately sized to accommodate half of the occupant load. Exit signs – signs are needed to identify exits and direct the ways to get to those exits. This includes location of such signs and how to illuminate them. Emergency lighting –When a fire occurs in a building, visibility is one key factor that could affect how occupants react to an emergency situation and their ability to evacuate. Posting maximum occupant load – signage indicating the maximum permitted occupant capacity for a building or space within a building. 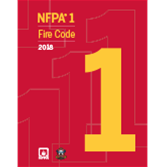 Apply NFPA 1, Fire Code to be confident buildings and facilities make the grade for fire protection and life safety.